Why should Galactus, Devourer of Worlds, have all the fun? 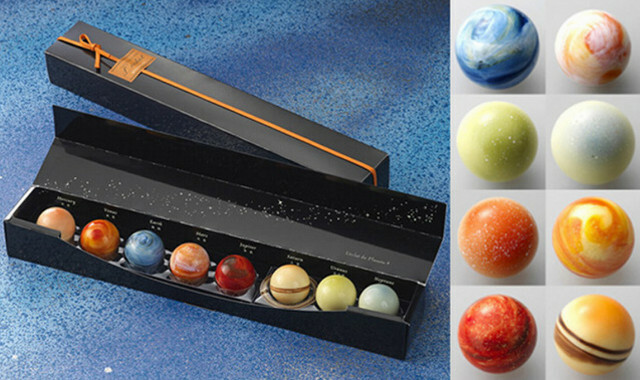 In a very cool bit of chocolate-related news, chocolatier L’éclat of the Righa Royal Hotel in Japan have released a special collection of 8-chocolates, each one carefully hand-painted to resemble one of the planets in our solar system. Sorry Pluto, but you and your fellow dwarf planets don’t get a mention. 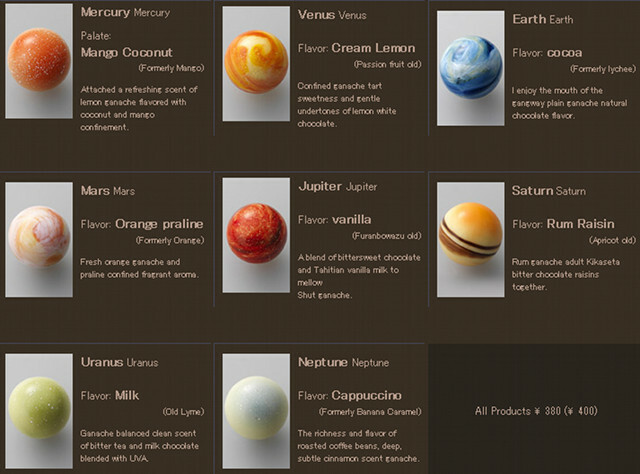 The chocolates are thankfully not to scale – or Jupiter and Saturn would take up all the room in the box – therefore Mercury provides just as substantial a mouthful as its larger siblings. Although the choc olates can be purchased individually, if you buy all 8 in a set you will get a space-themed box to contain them in, and they will also include a chocolate Sun (filled with criollo chocolate & pineapple). This is not the cheapest of indulgences, with the set retailing at approximately $50, and with the planet chocolates looking so beautifully detailed you’re not sure whether to eat or put on display. Recommended as a gift or extravagance for all space nuts and budding astronomers, or simply for those who like nothing more than treating themselves to an expensive box of chocolates. 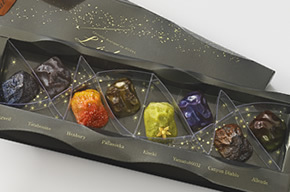 However if planets aren’t rocking your world and you’re more of a meteorite fan, then L’éclat can also help you out as they have also released a collection of 8-chocolates modeled after major meteorites that have been discovered around the world.